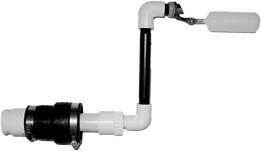 Provides pumping, filtration, skimming and overflow components for a ground level fountain pool. Includes the T75F Filtered Pump Vault. Optional Auto-Fill and Pump Shut-Off are available. *200 GPM with multiple skimmers. Contact us for system sizing and pricing. This system is designed for ground level fountain installations where the top of the Filtered Pump Vault is placed below the fountain's edge. 40 Gallon Expansion Reservoir. For use with the T40F & T75F Filtered Pump Vaults. 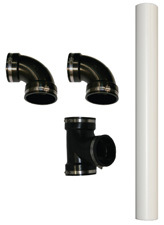 Requires either RC-44LL or RC-44LTL Connection Fittings. Connects (1) T40SP Expansion Reservoir to the T40F or T75F Filter Tank. Connects (2) T40SP Expansion Reservoirs to the T40F or T75F Filter Tank.